As expected, Collin Altamirano of Sacramento cracked the top 500 in the world for the first time today after winning a $15,000 Futures tournament in Singapore two weeks ago. Altamirano, 22, leaped 71 places to No. 491 in the latest rankings. The former University of Virginia standout also soared 102 spots in doubles to No. 652 after capturing the Singapore title with Francis Casey Alcantara of the Philippines. At the end of 2017, Altamirano was ranked No. 762 in singles and No. 1,551 in doubles. Altamirano turned pro last June after his junior year, forgoing a chance to join Stanford's Paul Goldstein and USC's Steve Johnson as the only men to win four NCAA team titles. Without 2017 NCAA singles champion Thai-Son Kwiatkowski, standout JC Aragone and Altamirano, the Cavaliers lost to Columbia, with Victor Pham of Saratoga in the San Francisco Bay Area and Austen Huang of Elk Grove in the Sacramento region, in the second round of the NCAAs last month. 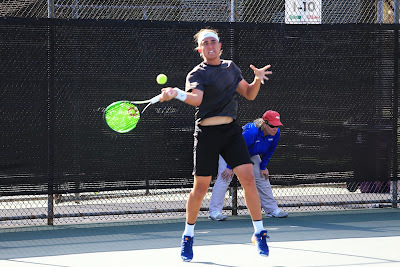 In 2013, Altamirano became the first unseeded player to win the USTA boys 18 title.